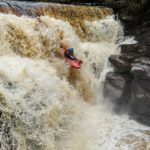 Illinois River 20200 CFS - Part One | DBP MAGAZINE ONLINE The World's Best Free Whitewater Publication. So I had planned this trip for about a week. A month and a half ago I had just run the same stretch at 12000. The trip had been very successful, and I was hoping for a chance to see it a little higher. Looking at the weather forecast and reading the discussions every 12 hours I was pretty confident that the Illinois would be at least as high as our last trip, probably higher, and this was what I was looking for. At first I was thinking about 15k, then 20k, then 30k. Friends were trying to convince me not to attempt it. I considered not attempting it, but the fact that we had run it so well at 12000 less than two months prior made it hard for me to give it a try. The day before our planned run the storm hit. It was an epic rain storm in the Southern Oregon area. Not only was there a lot of precip, but it all came down quickly. We had over four inches of rain in less than 12 hours near my house in Williams, and this usually means about triple in the coast range. The river rose quickly to 27000 cfs Friday afternoon, but as quickly as it rose it started to fall. Our plan was to catch the river just after the peak to miss most of the wood, but unfortunately this would mean running at night, which wasn’t going to happen. I really wanted to see the Illinois at a higher level than last time. A couple friends of mine, Quin and John, met me at my house Friday night, and we drove to our shuttle drivers house, “Bearfoot Brad”, in Gasquet that same night. Brad and his wife Jamie are the most hospitable people I know, and have always left their door open for this soggy, wet paddler. After drinking a few beers and listening to the rain start coming down again, we all felt a slight hope that the river would start on the rise again. 4:30 AM. Brad wakes up, turns on the computer, and starts his daily routine. Looking at weather forecasts, and prepping his daily report. He reports the level of the North Fork Smith every morning at 8 AM and has been doing it for decades. It was hard to sleep with a highwater Illinois trip looming over my head. So, sleeping on Brad’s couch, listening to him type away, eventually I got up. After I woke up I was elated, and a little sick, the river was 21000 cfs and rising. Also, over the course of the past 48 hours word of our trip had spread and there were more than three of us ready to go that morning. This trip started small and grew over time, and should have shrank if I would have listened to my conscience. (Crossroads #1) But, everyone who was one this trip at least called themselves “Class V Guides”, whether this was on Burnt Ranch, Cherry Creek, or their experience had evolved into boating in water not normally run by anybody. But, the fact remained that I didn’t know everyone, and I should have before jumping on the water with them. We had 11 boaters and 6 boats when all was said and done. Myself, and my friend Kelsey would take the medium boat and play safety for George and Shawn who were to R-2 a smaller green boat. Matt, Kim, and Tim were to R-3 a large boat, Ryan rowed the smallest boat, Quin rowed the orange boat I had taken last time, and John rowed a larger boat with Hiya riding a backseat. It took us a while to get things organized with this many people. It is amazingly hard to explain to people, even experienced boaters, what the water is like in this situation. People are severely disappointed if you tell them to come back when the water is lower. It surely is a knock to the ego, and who are you to say what type of boating they should do. Creature Crafts are great boats, and they allow exploration water that would normally be out of the question. However, they are just boats, and people have gotten into a lot of trouble with the thinking that the boat replaces skill, or even that you can just strap in and go along for the ride. We had all excellent boaters on this trip. Some had been on the 12000 trip, others had not, I knew most, but not all. Everyone performed to the best of their ability, and every boat had some mishaps. We all stuck together, and we made it out. However, for me, personally, I made a pact after that trip not to lead these types of trips again with people I hadn’t boated with fairly extensively. Lesson learned. Nonetheless, after a few hours of blowing up boats and rigging we were off. It was about 12:30 PM. The first 12 miles were fairly uneventful if you tried to stay out of the features. Matt tested his boat out in a enormous wave and was flipped right off the bat. He was in an R-3 setup and with new people to the Creature Craft world as his paddlers he was unable to roll. Eventually they figured it out, but only by having Matt unstrap and use his weight to right the boat. 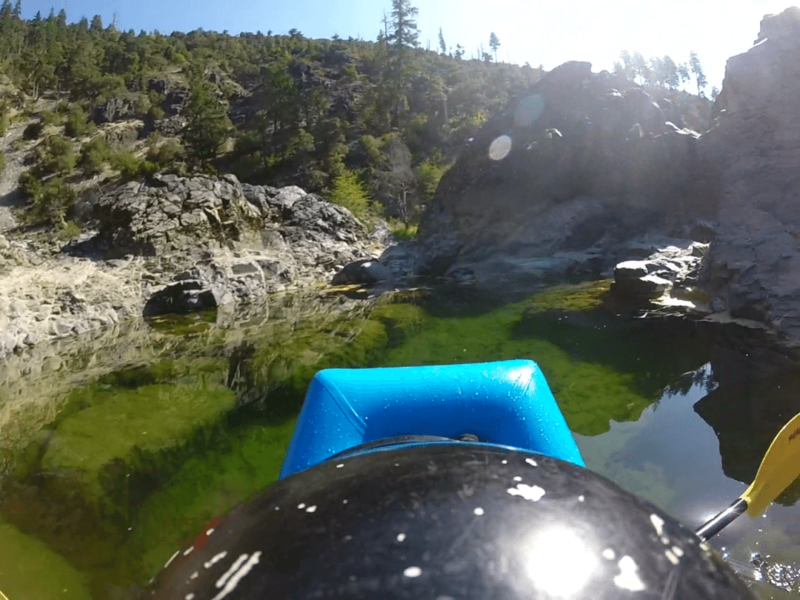 R-3 set ups are great if everyone is working together, but it exposes your paddlers to the river, and it can be a difficult maneuver to complete under stress. His two paddlers, although experienced, had never seen this type of water. Matt runs a large wave about 3 miles downstream from Mccaleb with not such good results! Panther Creek to Clear Creek seemed similar to last time. Bigger waves (15’+), large laterals, but again the center for the most part was the place to be. There weren’t too many big holes, but the laterals, and the boils really messed with you. My friend Kelsey who was riding in my backseat was stoked. I was still nervous, and it was a ton of work to maneuver the boat. It’s about three times harder to maneuver the boat with a backseat passenger, and so by the end of the first 12 miles I was getting a bit tired. I told him not to get too stoked, we haven’t seen the big stuff yet. We made it past Clear Creek Rapid, my nerves eased, and I began letting my guard down after that. (crossroads #2) At 12000 the rapids from here until Fawn Falls were fairly inconsequential. It appeared that it would be the same again as we moved down river. There was a large lateral coming off the left bank in rapid #27. With Kelsey’s encouragement, I thought it would be fun to typewriter the boat from left to right. We hit the lateral and I pulled back on the oars. We accelerated back to the right and we were all good. We rode that lateral at least a couple hundred feet to the right but at the end a large wave slapped the boat from the right and I flipped. Kelsey and I did not get the boat back over very fast. Perhaps 30 seconds passed until we reflipped. I could see downstream some rocks and I yelled “We’ve got to get this boat over NOW!” Somehow that yell was answered, but only right before dropping into one of the biggest and most retentive holes on the river. The hole was one of the strangest features I had seen, and I was able to get one good forward stroke in before we dropped into the meat. It swallowed our boat, and we spent a very violent time down there mostly underwater. I had the ride of my life along with Kelsey in the backseat in rapid #29. Don’t flip above that rapid if you think you’re going to have a hard time righting your boat back upright. We surfed on our top for a LONG time. Eventually we would bounce up and do a barrel roll just long enough to get a partial breath and get sucked back under water. Our feet were out of the foot cups since we had just rolled a couple seconds before dropping in. This may have been part of the issue with the boat. Also I was in the Rescue Craft which is outfitted for a motor. Part of the back floor is cut out. Not sure if this would be part of the issue of upside down surfing or not. Illinois River 20200 CFS - Part Two - DBP MAGAZINE ONLINE The World's Best Free Whitewater Publication.